Moses encounters God in a burning bush. God gives him the task to set the Israelites free. Moses is reluctant and asks God, “When I come to the Israelites and say to them, ‘The God of your ancestors sent me to you,’ and they ask me, ‘What is His Name?’ what shall I say to them?” (Exodus 3:13). God answers Moses: Ehyeh asher ehyeh (“I am who I am” or “I will be who I will be”). Ehyeh asher ehyeh is a name that does not describe God, rather it prescribes how God will interact with humanity in the future. My Hebrew name is Tuvya (“Goodness of God”). I do not believe the name describes me; rather, my name reminds me how I am to behave every day. I often ask couples who bring their child for a baby naming to explain to me who they are naming their child after and why. Often the name expresses not only a desire to remember that relative but also a hope that the child will embody the attributes of that person. 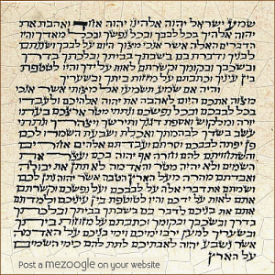 How have the names of the Divine Presence in the Torah evolved (Elohim, El, Adonai, El Shaddai)? What traits do you attribute to them? What does the name Ehyeh asher ehyeh suggest to you? Does your name or title describe you (or an aspect of you) or prescribe a certain behavior from you? How does the notion of an evolving name for the Divine Presence impact how you view God?